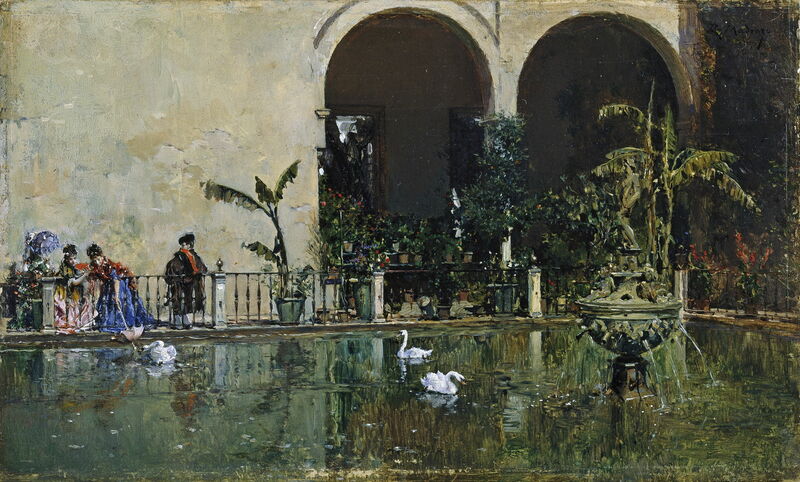 Raimundo de Madrazo y Garreta (1841–1920), Pond in the Gardens of the Alcázar de Sevilla (1868), oil on board, 10 × 16.4 cm, Museo Nacional del Prado, Madrid, Spain. Wikimedia Commons. 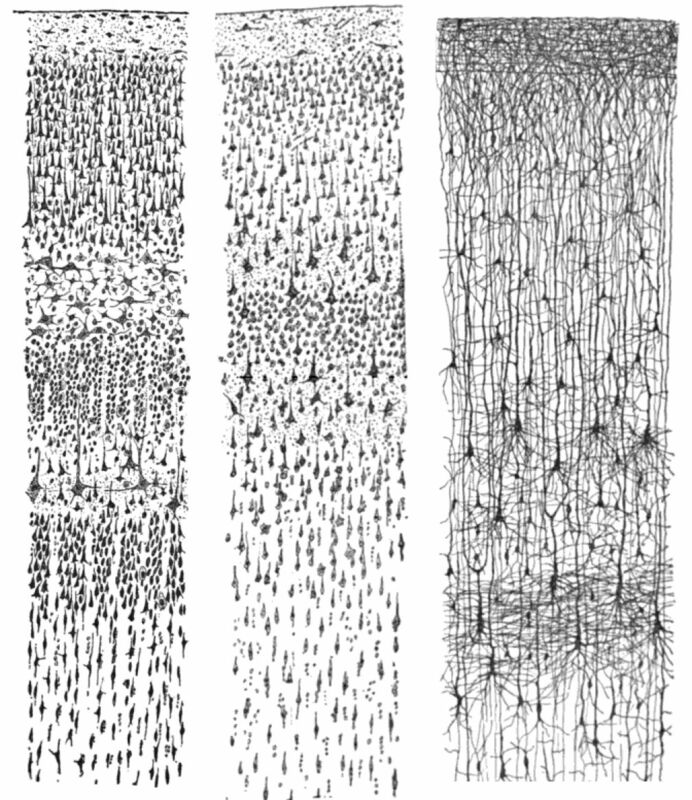 Most of the pioneering studies of the brain and retina were based on drawings of what the researcher saw down the microscope. Among the most important of those neuroscientists, who made many of the most exquisitely beautiful drawings, was Santiago Ramón y Cajal (1852-1934). Santiago Ramón y Cajal (1852-1934), Nissl- and Golgi-stained cerebral cortex specimens (date not known), in ‘Comparative study of the sensory areas of the human cortex’, further details not known. Wikimedia Commons. The son of a teacher of anatomy in Navarre, in Basque Spain, he was a troublesome child, and was shipped from one school to the next, only to cause more trouble, and move on again. At one time, he even fired a cannon in his back garden, which must have set the whole neighbourhood against him. Ramón y Cajal wanted to be an artist, but his father finally managed to interest him in anatomical drawing. He went on to study medicine at the University of Zaragoza, and eventually became the founding father of modern neuroanatomy, and more. 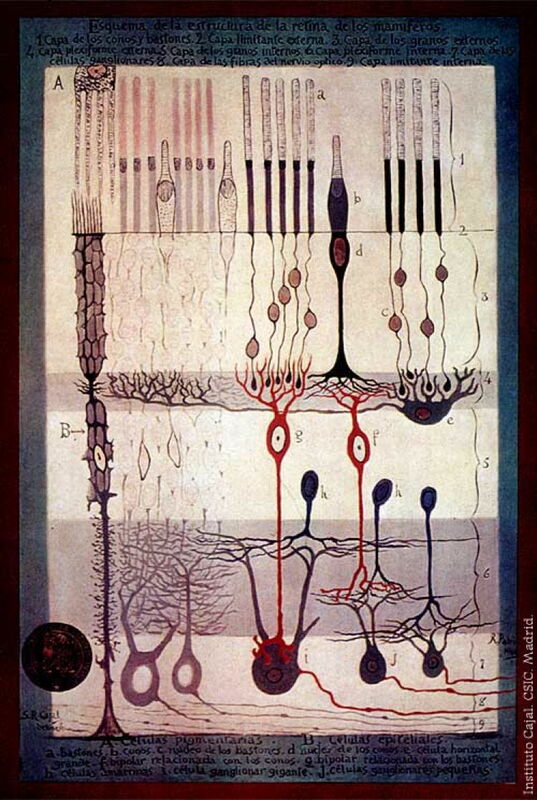 Santiago Ramón y Cajal (1852-1934), Structure of the Mammalian Retina (c 1900), book illustration, further details not known. Wikimedia Commons. It was he who discovered the fine structure of the human retina, crucial information for our understanding of the sense of sight. It seems very appropriate that a scientist who wanted to paint but ended up spending so much of his life drawing should have played such as key role in understanding this sense. And as always, it was his painstaking draughtmanship which showed to others what he had seen under his microscope. Ramón y Cajal’s portrait was painted at least three times during his life: two of those paintings show him in his mid-fifties, at the height of his career. Joaquín Sorolla (1863–1923), Santiago Ramón y Cajal (1852-1934) (1906), oil on canvas, 91 x 127 cm, Museo de Zaragoza, Zaragoza, Spain. Wikimedia Commons. Joaquín Sorolla’s shows him in what I think is an academic gown rather than a cloak. On the wall behind is one of Ramón y Cajal’s neuroanatomical drawings, looking like a work of art. But the great scientist looks old, care-worn, and tired. Ricardo de Madrazo (1851–1917), Santiago Ramón y Cajal (1852-1934) (1906 or 1910), oil on canvas, dimensions not known, Ateneo de Madrid, Madrid, Spain. Wikimedia Commons. 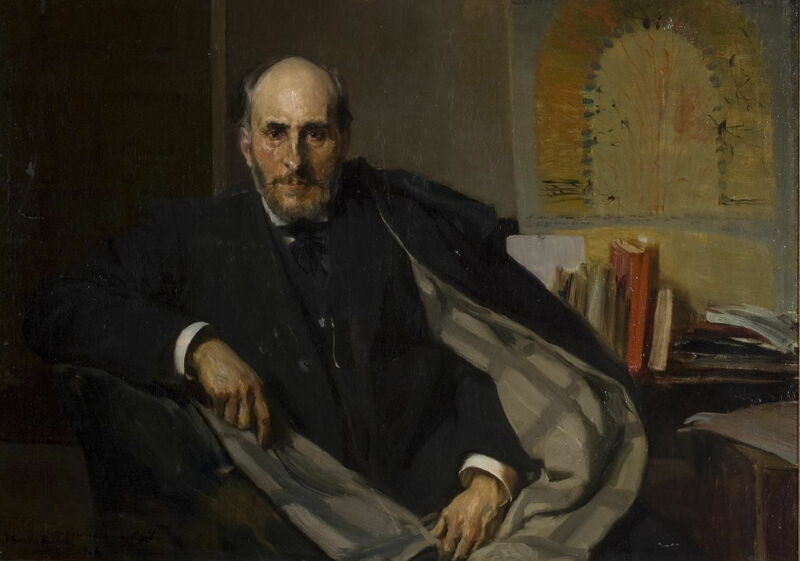 Given that Ramón y Cajal worked almost up to the day of his death in 1934, I can’t help thinking that Ricardo de Madrazo’s portrait appears more fair. He is seen at work, looking into the microscope with which he must have spent so many long days studying slides of brains, drawing every finest detail, hour after hour. 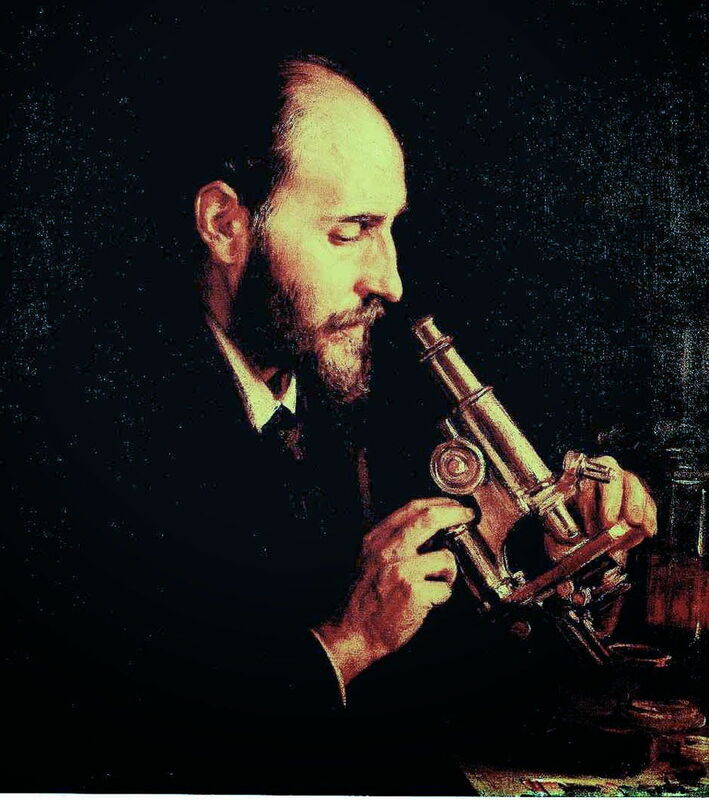 Ricardo de Madrazo was just a year older than Ramón y Cajal, and came from a family of painters. His turning point came when he met Marià (Mariano) Fortuny in 1866. He later accompanied Fortuny to North Africa, where he became smitten with orientalism. 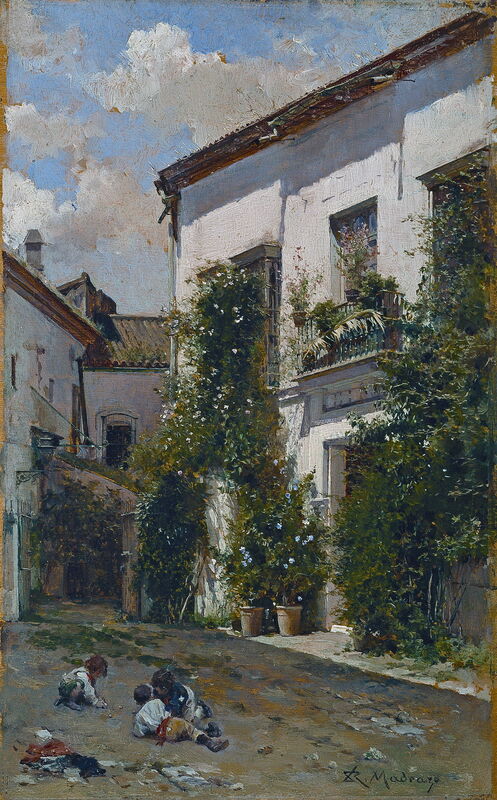 Ricardo de Madrazo (1851–1917), Mariano Fortuny’s Studio in Rome (1874), further details not known, Museo Nacional de Catalunya, Barcelona, Spain. Wikimedia Commons. 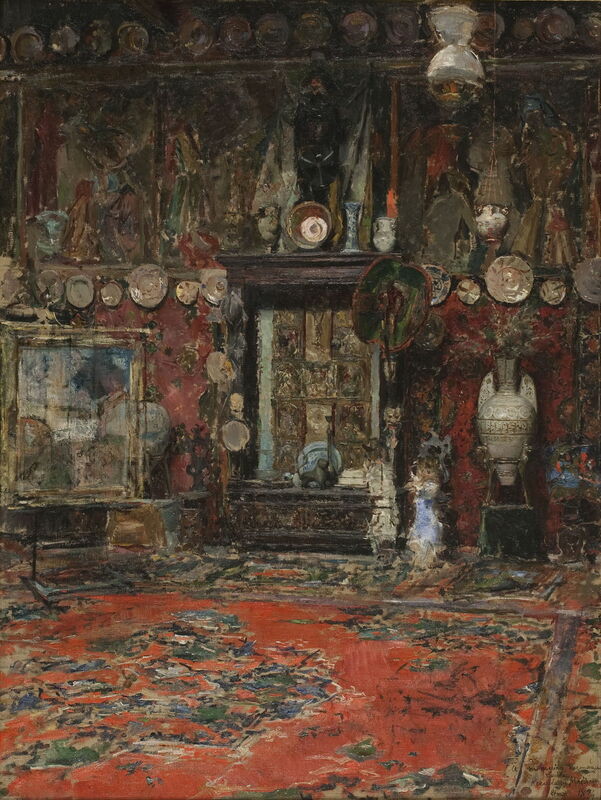 Fortuny died suddenly in 1874, and Ricardo de Madrazo took care of his studio and remaining works, showing its interior in this painting of his own. Ricardo de Madrazo (1851–1917), Halt for an Arab Caravan (1877), oil on canvas, 52 x 88 cm, Private collection. Wikimedia Commons. 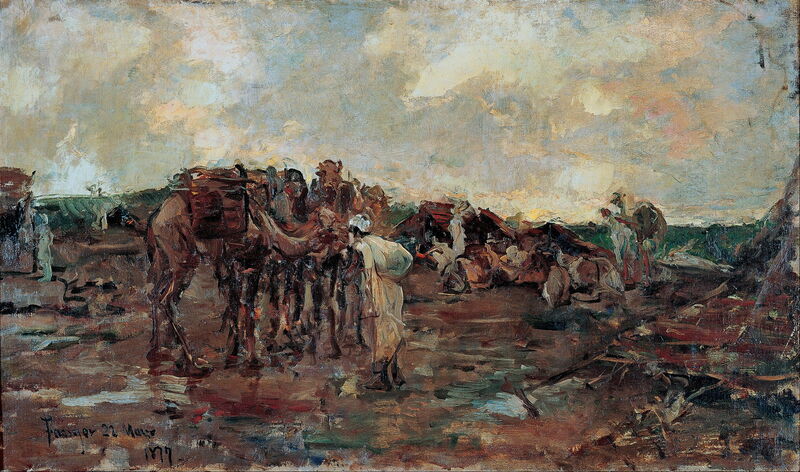 Ricardo was, though, better known for his orientalist works, such as this very painterly Halt for an Arab Caravan (1877). Ricardo de Madrazo (1851–1917), Raimundo de Madrazo y Garreta, Paris 25 March 1870 (1870), watercolor on paper, dimensions not known, Dallas Meadows Museum, Dallas, TX. Wikimedia Commons. 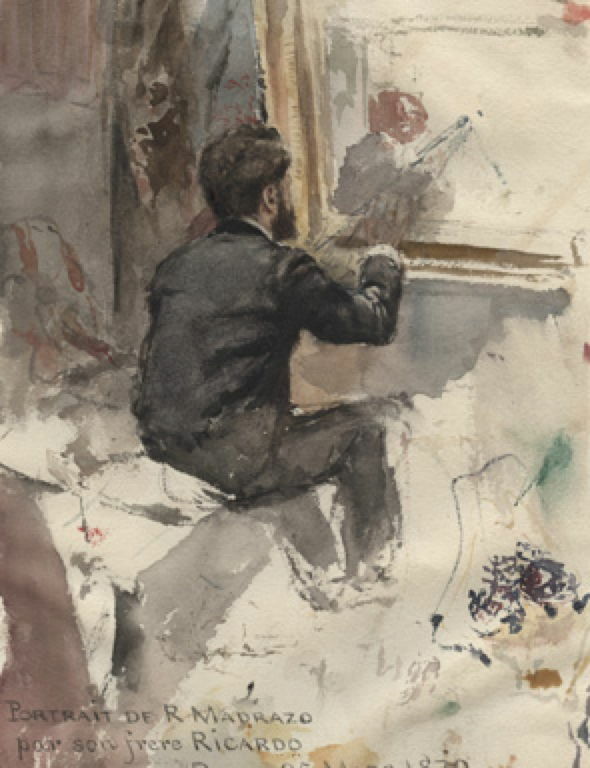 Ricardo also painted this quick watercolour sketch of his brother Raimundo at work in his studio in Paris in 1870. 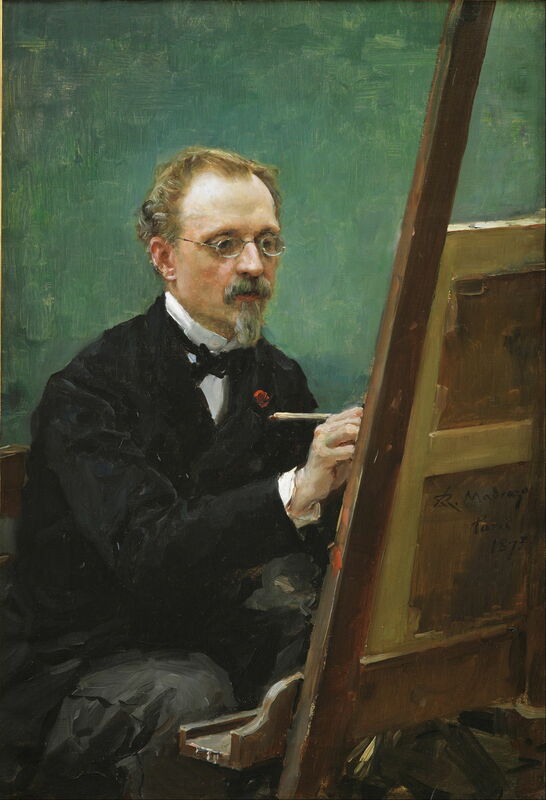 Raimundo de Madrazo y Garreta was ten years older than Ricardo, and I can only describe his style as being Impressionist, although he doesn’t appear in lists of those associated with Impressionism. He painted quickly outdoors, with strong colours, and loose brushstrokes – that seems good enough to make him a Spanish Impressionist, at least. Raimundo de Madrazo y Garreta (1841–1920), The Patio of San Miguel in Seville Cathedral (1868), oil on board, 15.8 × 10 cm, Museo Nacional del Prado, Madrid, Spain. Wikimedia Commons. He painted this remarkable view of three young boys playing in The Patio of San Miguel in Seville Cathedral in 1868, when the French Impressionists were still sorting out their styles. In the same year, he painted this view of the Pond in the Gardens of the Alcázar de Sevilla. 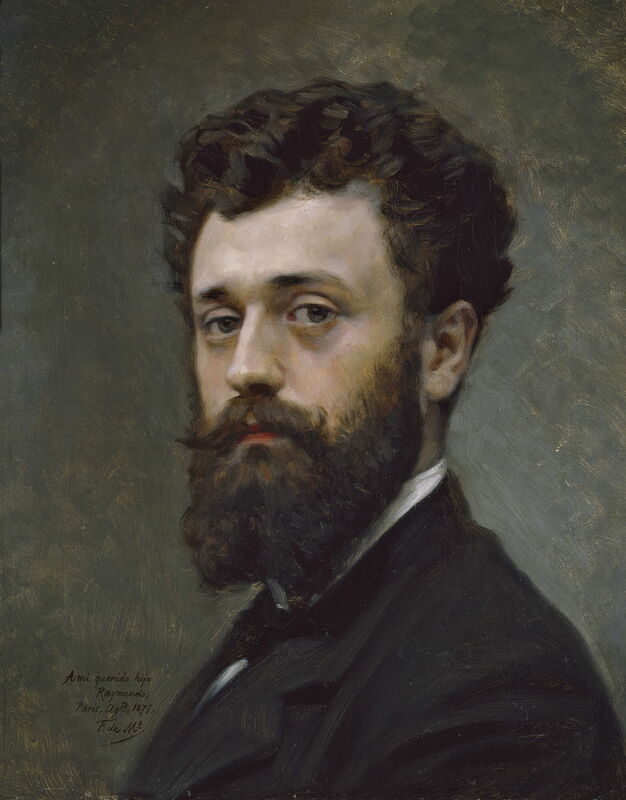 Raimundo was born in Rome, presumably when his father was painting there, was taught by Léon Cogniet, and soon became good friends with Alfred Stevens, the Belgian artist. He too worked with Marià Fortuny until the latter’s death. Raimundo de Madrazo y Garreta (1841–1920), Federico de Madrazo y Kuntz (1815-1894) (1875), oil on canvas, 56 x 38 cm, Bilboko Arte Ederren Museoa / Museo de Bellas Artes de Bilbao, Bilbao, Spain. Wikimedia Commons. Raimundo was best known at the time as a portrait painter. Among his many superb portraits is this of his father Federico de Madrazo y Kuntz (1815-1894), painted in 1875 when his father was sixty. Federico was also the son of a painter, and he too was born in Rome, like his son Raimundo. He became a major portrait painter of his day, among whose many eminent subjects was the great French artist JAD Ingres. He was commissioned to paint for the palace at Versailles, and had a long and distinguished career exhibiting at the Salon. He was later appointed the Director of the Museo del Prado, which now owns several of these paintings, together with one of the leading collections of art in Europe. Federico de Madrazo y Kuntz (1815–1894), Raimundo de Madrazo y Garreta (1841–1920) (1875), oil on canvas, 46.5 × 38.5 cm, Museo Nacional del Prado, Madrid, Spain. Wikimedia Commons. 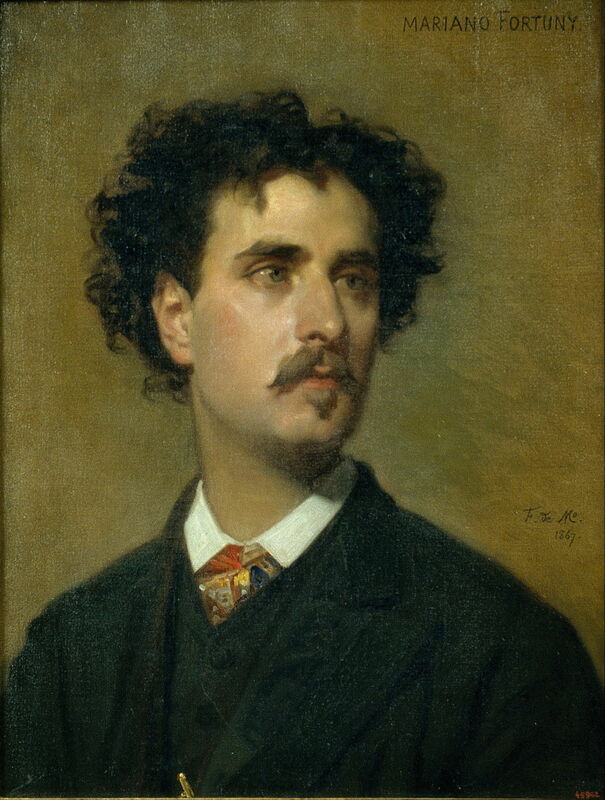 Federico de Madrazo y Kuntz painted his son Raimundo’s portrait in 1875, after he had painted Marià Fortuny in 1867 (below). Federico de Madrazo y Kuntz (1815–1894), Mariano Fortuny (1838-1874) (1867), oil on canvas, 54 x 42.5 cm, Museu Nacional d’Art de Catalunya, Barcelona, Spain. Wikimedia Commons. This chain of portraits leads us back to the central figure of Marià Fortuny. I will look at his tragically brief but highly productive life this weekend. Posted in General, Life, Painting, Technology and tagged anatomy, brain, de Madrazo, Fortuny, Impressionism, painting, Ramón y Cajal, Sorolla, vision. Bookmark the permalink.